Liebherr luffing jib cranes at work on the Kingdom Tower. Liebherr, a leading German manufacturer of construction equipment ranging from concrete pumps to cranes, continues to help build some of the landmarks in the Gulf region. Among the latest prestigious projects that are utilising its equipment is the Kingdom Tower in Jeddah, Saudi Arabia, which is designed to be the tallest building in the world at a height of more than 1,000 m.
Liebherr is supplying four HC-L series tower cranes for the project, which include three 280 HC-L luffing jib cranes and one 357 HC-L model. 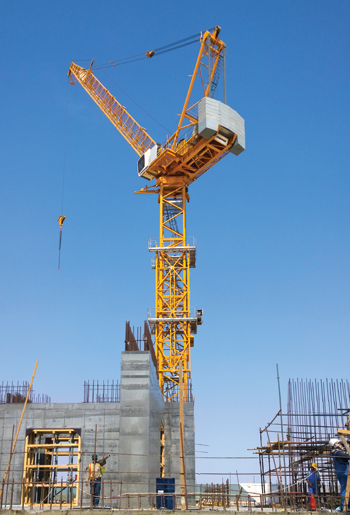 The experts at Liebherr Tower Crane Solutions are providing support to the contractor to ensure economical crane planning. Three Liebherr 280 HC L luffing jib cranes are being used to build the side wings of the Kingdom Tower. These cranes are anchored on the outside of the building and will reach hook heights of approximately 400 m.
The Liebherr 357 HC-L luffing jib crane will place the top on the building at a height of around 1,000 m. To get to this height, it will first have to climb up into the air by itself in the central building, says a spokesman for the company. “To reach these heights, the cranes will have to move upwards in several climbing stages. To achieve this, they will be positioned on the sky terrace of the building or on various cantilever platforms mounted on the outside of the building. The tower cranes on the Kingdom Tower site will erect and dismantle each other,” he adds. The spokesman continues: “The reliability of the cranes and crane logistics is a major factor in the success of the project as a whole. The good experience which the contractor has had to date with Liebherr cranes on other projects was one of the main reasons for their use on the Kingdom Tower. Other landmark projects where Liebherr equipment has been in use is the new National Museum in Qatar, where 12 of its tower cranes were utilised.